Streaming video giant Netflix (NFLX - Get Report) is trading below its 50-day simple moving average on news Walt Disney (DIS - Get Report) is launching a streaming video product that's half the price. My call is to buy weakness on Netflix to its monthly and semiannual value levels at $331.02 and $327.12, respectively, and book profits on Disney on strength to its annual risky level up at $138.93. Netflix is up 31.2% year to date and in bull market territory 51.9% above its Dec. 26 low of $231.23 and in correction territory 17.0% below its all-time intraday high of $423.20 set on June 21. Disney is up 18.6% year to date and in bull market territory 29.6% above its Dec. 24 low of $100.35. The stock set its all-time intraday high of $132.39 this morning. Analysts expect Netflix to earn 57 cents to 60 cents a share when it reports after the closing bell Tuesday, April 16. Netflix is not a value play, as its P/E ratio is 131.02 and does not offer a dividend, according to Macrotrends. Netflix is the "N" of the FAANG family and is losing momentum, as shown in the weekly chart below. The company has beaten analysts' estimates in four consecutive quarters. Netflix offered disappointing earnings guidance in July, which was a lingering issue into 2019. In January, it showed 8.8 million new subscribers, which streamed the stock higher to its 2019 high of $379.00 on March 21. Netflix raised its subscription fee to $13 per month so a key metric is whether increased competition has crimped its growth guidance? Disney owns content and will add new programming but its Disney+ streaming video on-demand service will cost just $6.99 per month. Their projected expenses for original programming should be manageable, rising to about $2.5 billion into 2024 from $1.0 billion in the first year. This daily chart for Netflix shows the bear market decline of 34% from its all-time intraday high of $351.14 set on June 21 to its Dec. 26 low of $213.23. Dec. 26 proved to be a "key reversal" day as the close of $253.67 was above the Dec. 24 high of $250.65. A positive "key reversal" is a signal that a tradeable rally will begin. 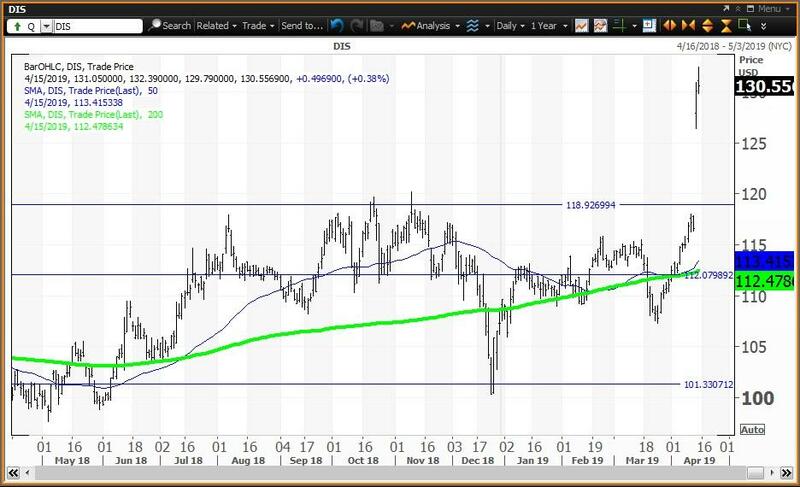 The close of $267.66 on Dec. 31 was an important input to my proprietary analytics and resulted in an annual value level down at $217.12 and a semiannual risky level at $327.12, which was a pivot (or magnet) between Jan. 22 and Jan. 24 as a buying opportunity. The close of $356.56 on March 29 was the latest input to my analytics and resulted in a monthly value level at $331.02 and a quarterly risky level at $422.06. 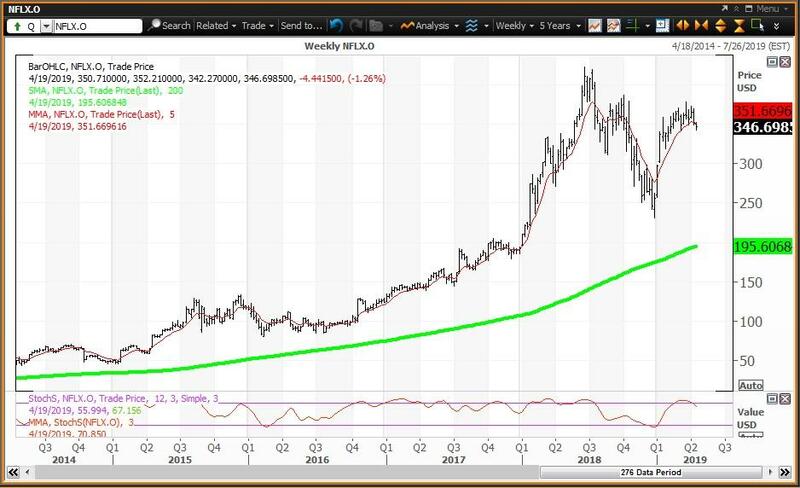 The weekly chart for Netflix will become negative on a negative reaction to earnings as the stock is already below its five-week modified moving average of $351.60. The stock is well above its 200-week SMA or "reversion to the mean" at $195.61. The 12x3x3 weekly slow stochastic reading is projected to decline to 70.81 this week down from 78.28 on April 12. Trading Strategy: Buy weakness to its monthly and semiannual value levels at $331.02 and $327.12, respectively, and reduce holdings at its March 21 high at $379.00. Back on April 3, I wrote "Buy Disney as a Core Portfolio Holding." The stock remains reasonably priced with a P/E ratio of 18.50 and dividend yield of 1.35%, according to Macrotrends. On Friday, the stock gapped above its semiannual risky level now a pivot at $118.95. That's reason enough to reduce holdings up to its annual risky level at $138.93. The daily chart shows the stock set its Christmas low of $100.35 on Dec. 24. The close of $109.65 on Dec. 31 was the input to my proprietary analytics and resulted in a semiannual pivot at $118.95 and annual risky level at $138.93, respectively, which is my upside target. 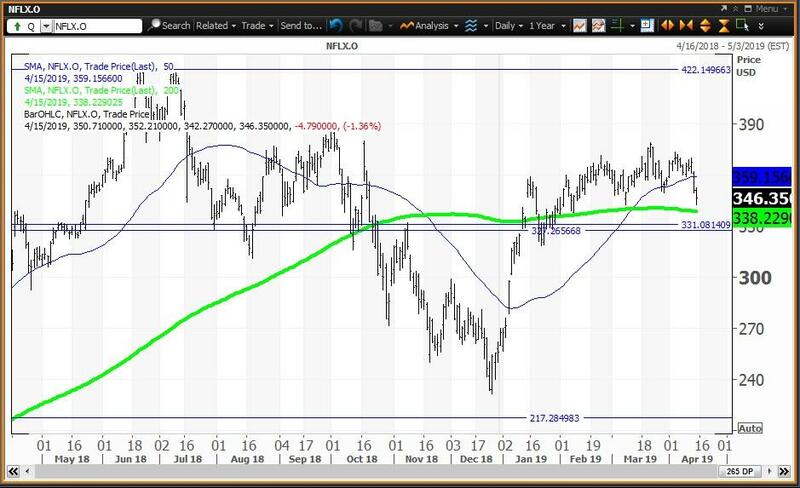 The close of $111.03 on March 29 was the latest input to my analytics and this resulted in a quarterly value level at $101.33 and a monthly pivot at $112.07. 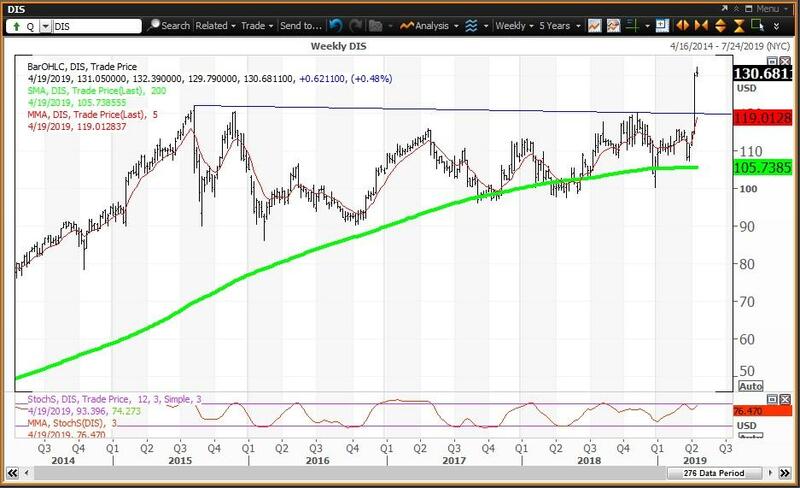 The weekly chart for Disney is positive with the stock above its five-week modified moving average of $118.90. The stock is above its 200-week simple moving average or "reversion to the mean" at $105.74. The 12x3x3 weekly slow stochastic reading is expected to rise to 76.23 this week up from 68.01 on April 12. Note the breakout above the trend line connecting the highs going back to August 2015. Trading Strategy: Buy the stock on weakness to my semiannual pivot at $118.95 and reduce holdings on strength to its annual risky level at $138.93. Value levels and risky levels are based on the last nine weekly, monthly, quarterly, semiannual and annual closes. The first set of levels were based on the closes on Dec. 31. The original semiannual and annual levels remain in play. The weekly level changes each week; the monthly level was changed at the end of January, February and March. The quarterly level was changed at the end of March. My theory is that nine years of volatility between closes are enough to assume that all possible bullish or bearish events for the stock are factored in already. To capture share price volatility, investors should buy on weakness to a value level and reduce holdings on strength to a risky level. A pivot is a value level or risky level that was violated within its time horizon. Pivots act as magnets that have a high probability of being tested again before its time horizon expires.